Vincent Bollore, pictured in London this week, already has electric car-sharing programs operating in Paris, Lyon and Bordeaux, France. LONDON (Reuters) -- French billionaire Vincent Bollore has unveiled plans to park 3,000 electric cars on London streets by 2016, as part of a car-sharing scheme that emulates the popular bike-sharing program started in 2010 under Mayor Boris Johnson. 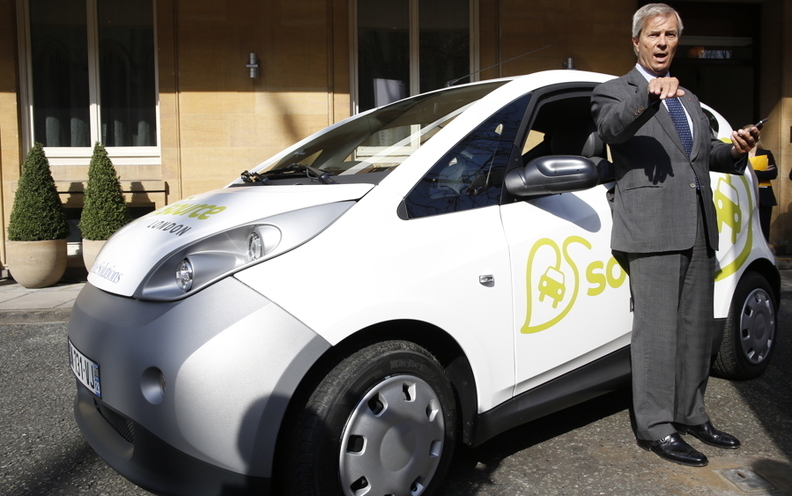 Bollore, CEO of the group bearing his name which set up the Autolib electric car-sharing program in Paris in 2011, said that car-sharing fleets of battery-powered cars could help cut congestion and reduce pollution in the British capital. "Pollution becomes a nightmare ... so many cities where you can't even go out and the planes can't take off and you have to solve this problem," Bollore told Reuters at the launch of the scheme on Wednesday alongside one of the compact, silver-and-white cars. Facing tougher environmental regulation and growing demand for less-polluting cars, automakers are investing heavily in electric vehicles, but many consumers have been deterred by the limited distance that electric cars can go on a single charge. Bollore, whose company has interests in transport, media and electricity storage, said the yet-to-be-named car-sharing scheme would be serviced by 6,000 charging points installed around London by 2018, up from the current 1,400. Users will be able to rent a car for 10 pounds (about 12 euros) an hour, using a smartphone app to find a pick-up point, then leave it at one of an unspecified number of locations. Already-established car-sharing schemes such as Avis unit Zipcar, Hertz and independently owned City Car Club only allow drivers to collect and leave vehicles at the same spot. They also use mostly conventionally powered vehicles. Bollore said drivers would be issued with a card that acts as a key and recognized them, even remembering their favorite radio station. He said 100 vehicles would be parked around London in the next year with the rest to follow by 2016. The Bollore group, which also operates car clubs in the French cities Lyon and Bordeaux, said it was investing 100 million pounds into the UK initiative, with some 60 million to be spent a year on maintaining vehicles and running the business. In Paris, the car-sharing scheme has about 12,000 rentals a day and more than 4,800 charge points. It expects to break even ahead of its expected target in November this year. Bollore said he was planning to open his company's first U.S. scheme in Indianapolis, Indiana, this year with 500 cars and 1,000 charge points. A lawyer by training and previously an investment banker, Bollore, 61, has become rich by taking stakes in troubled companies, building an investment conglomerate from the family's paper mills in Brittany, western France. Some Londoners, however, were less than impressed. "There's so much traffic around that I think I'd spend the whole 20 minutes or so stood in traffic, so I don't see the point of it," marketing assistant Lucy Pearce said. Insurance broker Martin Parfitt said he'd rather stick with a cramped train on London's underground. "The roads are snarled up and I think it will just create more pollution in the city."